All of the trademarks here are for remedies that fall under the broad category of “patent medicines.” However, the manufacturers of patent medicines rarely obtained patents from the federal government. Patenting a remedy would have meant publicly disclosing its ingredients. Manufacturers were not eager to publish the contents of their products, which were short on medicinal quality and long on addictive and harmful substances. After the 1906 passage of the federal Pure Food and Drug Act, which required ingredients such as cocaine, opium, and alcohol to be properly accounted for, there was an appreciable decrease in the sale of many patent medicines. Prior to 1906, manufacturers weren’t restricted in the claims they could make regarding a product’s effectiveness. 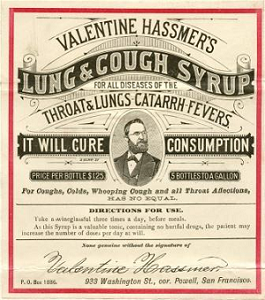 Most patent medicines were promoted as cures for a wide variety of ailments from the serious, such as malaria and tuberculosis, to the more benign, including aches, pains, and the common cold. Note that, for all the trademarked medicinal syrups listed here, the ingredients are not mentioned, but extensive claims are made as to the healing powers of the products. Another marketing tool that manufacturers of patent medicines used was to portray their medicines as scientific and, therefore, more likely to work. One of the biggest scientific “discoveries” being marketed as a miracle cure during the late 1800’s and early 1900’s was electricity. While vague on how the cure would actually work, most electric cures played on magical and generally mysterious properties. Webster’s Dictionary defines ague as, "a fever (as malaria) marked by paroxysms of chills, fever, and sweating that recur at regular intervals." 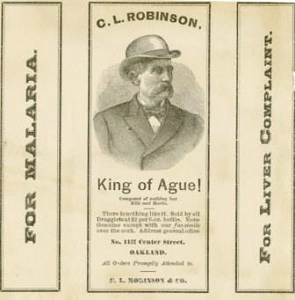 Although generally meaning fever, the word "ague" over time became associated with the particularized fever associated with malaria.